As the school year winds down, you will want to make sure your tweens and teens have plenty of activities to keep them busy through their summer break. While your teen may have already planned on spending the summer sitting in front of the TV playing video games and binge watching shows on Netflix, there are plenty of other things they can do while still enjoying themselves, like learning how to sew. Stuffed Animals – Making stuffed animals is a great beginner project for tweens and teens. It helps them become familiar with how to work the sewing machine. Themed T-Shirt Comforter Cover – Tweens and teens can take themed t-shirts that no longer fit, or which are wearing out, and make a customized quilt by sewing together cut up squares of the t-shirt logo or image. Blue Jeans Shorts/Skirts – Show your teens how to take jeans which are worn out below, from the knees down, and convert these into shorts or skirts. Blue Jeans Purse – Your tween/teen can use the leftover jean material, from the jeans they made into shorts or skirts, and make a basic purse. Themed Hoodies – Remove the sleeves from themed t-shirts and the side seams. Now stitch this over a solid colored hoodie to create a one-of-a-kind themed hoodie. Your tween/teen can put their own finishing touches on all of their sewing projects by using custom clothing labels, personalized in the color and text they prefer. 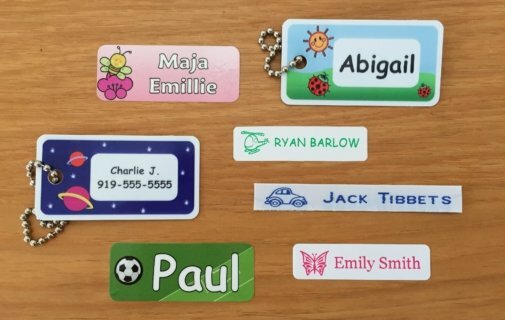 To find the perfect labels for clothing, and for all of yours or your tweens’ or teens’ sewing projects, contact It’s Mine Labels by calling 1.866.695.2235 today.